Cajons, or cajon drums, or percussion boxes, are very old instruments. They are considered important instruments and significant to the development of the Afro-Peruvian culture. Although modern cajons have evolved, and the tonal profiles are somewhat complex, there’s still something very austere about the way they sound. Traditionally, cajons weren’t used in the type of music we hear today, other than perhaps Flamenco. These days it’s not uncommon for blues bands or even jazz bands to sometimes incorporate the instrument. However, there’s a time and a place for a cajon. Understanding the instrument, what it does, and how it plays is important if you want to make the most of it. Start things off by checking out some of my personal favorite modern cajons. These are the best cajons according to me, consisting of personal favorites and drum boxes that are popular right now. What Music Genres Use Cajon Drums? This cajon is a breeze to carry if you play gigs. It weighs under 11lbs and it’s rather compact in size too. The design is simplistic, which is often a good thing. Adding too many bells and whistles can only take away from the clarity of this classic instrument. At the bottom of the percussion box you’ll notice rubber-capped feet. This is very nice to have as it reduces vibrations and helps maintain sound clarity. Still, the box isn’t the sturdiest or thickest, which means it’s not suited for on-stage performances. Ideally, it should be placed on hard surfaces when playing. To tune the internal guitar strings in this stringed cajon, you can use the included hex key. Although this may not look like much, for a lot of people it’s the sound quality that matters. I happen to agree. The strings create a smooth and balanced tone. 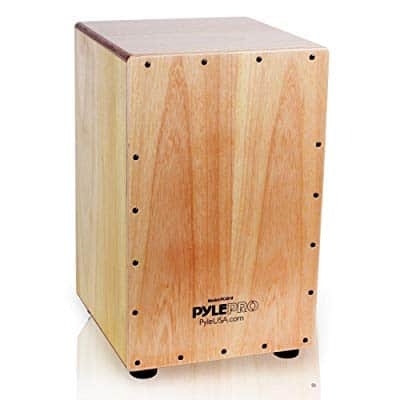 The Pyle Jam cajon can lend itself well to funk, jazz, blues, and acoustic soft rock. Due to its particular tone, you can even use it as an extra instrument that can accent certain beats along with the traditional drum kit. Overall, this is easily one of the best cajons owing to its sound quality and versatility. 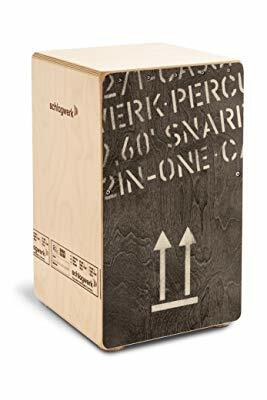 Another jam cajon comes courtesy of Meinl, the world-renowned percussion instruments manufacturer, which has quite a few cajons under the belt. However, it’s this one that struck a chord with me for its compact size and versatile sound. At 15” tall, the percussion box is quite comfortable to sit on. The rectangular design sees the cajon at 10.25” in width and depth, which makes it an easy to carry instrument. The construction is also spot-on due to the choice of materials. The box uses birch wood that gives it good durability. The feet are rubber-capped in order to limit vibrations and they’re not as tall as the ones on other models. This makes the percussion box a lot more stable. Inside you’ll find snare wires. Because of this, the cajon is suited as a drum kit replacement in various musical genres. The sound is not very balanced out of the box but you can adjust the tension of the strings to fit your needs. Where you strike it also matters. Centered slaps create a fairly low bass sound. Going higher on the sides can create a tight snare drum sound. Overall, the tone can be fairly rich as long as you make some minor adjustments, such as changing the distance between the resonating box and the front face. Although Schlagwerk is a long way from Peru, this German manufacturer has a top reputation in the business. The CP404 features very sturdy construction and a complex spiral arrangement inside the box which allows for up to 40 snare wires. What I enjoyed most about this model is that the spiral structure can be removed. If you do that, you will then be able to play with that traditional clean Peruvian sound. This is also the reason why it’s called a 2-in-1 cajon. It can deliver two very distinct types of sound. Another reason why you might like this model is the size. The area is 11.8 x 11.8 inches and the height is 19.7 inches. This makes it a lot more suitable for taller musicians. Slapping the front plate requires less arching of the back. By making it easy to maintain a proper posture, the CP404 already offers a lot of bang for your buck. Nevertheless, the size and output volume are not all the features worth mentioning. The resonance box has eight layers of birch which makes it both durable and deep-sounding. The Beachwood front panel adds to the durability and weight capacity of the cajon. The corners and edges are not rounded but they are very smooth. 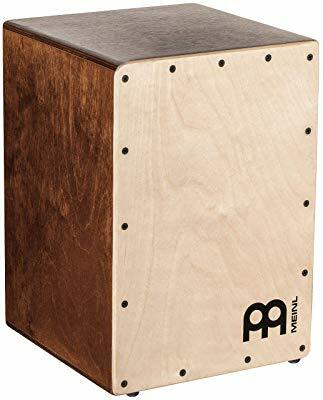 It’s not among the cheaper cajons on the market but the level of versatility and durability makes it worth every penny for professional cajon players. 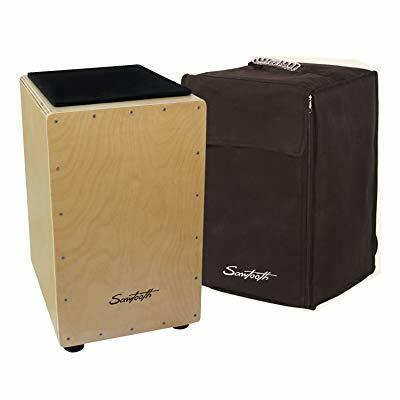 The Sawtooth ST-CJ120B is a birch cajon drum that’s been made for maximum portability. The feet are a bit thicker than usual and rubber-padded. The package includes a carry bag, which helps protect the box faces as well as makes it easier on the musician. Whether you use it at home, at a studio, or in concert, the ST-CJ120B is made for comfort. The stability is great due to the thicker feet. And the padded seat cushion will help you maintain a proper playing posture for longer. The 19.5” tall percussion box has a very good output. The craftsmanship on the body is something to be commended, but unfortunately, it outshines the sound quality. The snare wire system is fully adjustable but takes a lot of tinkering to make it sound acceptably balanced. The ST-CJ120B leans towards a tighter slapping sound with a bit of echo. Luckily, the front plate can be easily adjusted to cut down on the echo. Of course, not all cajons sound amazing before you tweak the wire tension and adjust the plates, so I can’t fault Sawtooth too much for this. 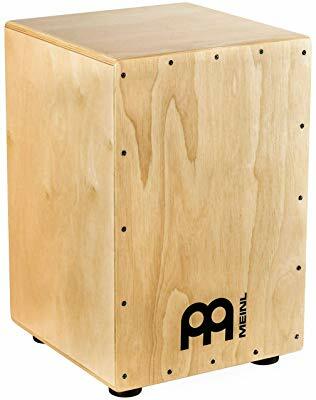 This is a hardwood string cajon that Meinl designed for more professional players. Some may say that the HCAJ1NT is made to deliver a traditional Peruvian sound, but the crispness of the snare zones indicates otherwise. This cajon is better suited for players that want to imitate a modern drum kit. It has a deep bass sound when striking the center and a tight snare tone when playing on the top corners. Adjustments can be made to improve the clarity and sustain of the snare sound. The overall tonal quality is surprisingly good before making any adjustments. The resonator box is pretty big, as is the cajon box itself at 18” tall and 12” deep. Because of its size, the cajon is comfortable to sit and play on. It doesn’t make it easy to carry between gigs, especially since there’s no carry bag included. However, the hardwood body gives the cajon amazing durability. It may not look like much aesthetically-speaking, but it’s a rugged instrument that can handle life on the road. If you want to look like a true professional, there are very few cajons that can pull off a luxurious look. The Latin Percussion LPA1332 is one of them. It’s available in four colors, although the dark wood streak is by far the most visually imposing to me. The build quality certainly does the price justice. Not only that, but the design also makes the cajon comfortable and safe to play on. This bulky model has very good stability and you don’t have to worry about banging into the rounded corners and edges. This modern cajon features snare wires, three sets of them to be exact. This allows you to emulate a standard drum kit quite well if you alternate slaps between the corners and the center of the front plate (for the kick drum sound). Be that as it may, I was surprised to hear how woody and traditional this percussion box sounded when the wires were adjusted properly. 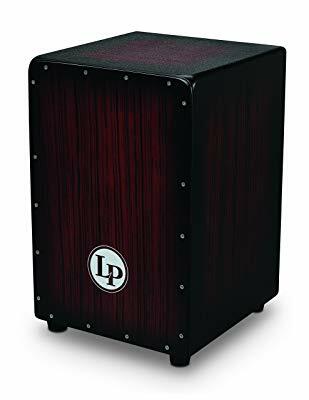 Dialing down the tone of the snare gives this cajon a passable Peruvian cajon sound, which makes this instrument quite versatile for amateur and professional players. In the right hands, you can incorporate the LP into both traditional and modern ensembles. Not a lot of cajons have this tonal diversity. Let’s get one thing straight. This instrument is very fun to use and very versatile. However, even though it offers plenty of range, you can’t use it as an accompaniment in just any band. Cajon drums are particularly popular with Flamenco, rumba, and even in soft acoustic rock as a replacement for a traditional drum set. Some blues and funk jazz might also use cajon drums when playing live in a simple arrangement. But of course, not all cajon drums are designed to accompany a wide range of styles. On the other hand, sometimes a band would have no choice but to use a cajon, even for amplified music. 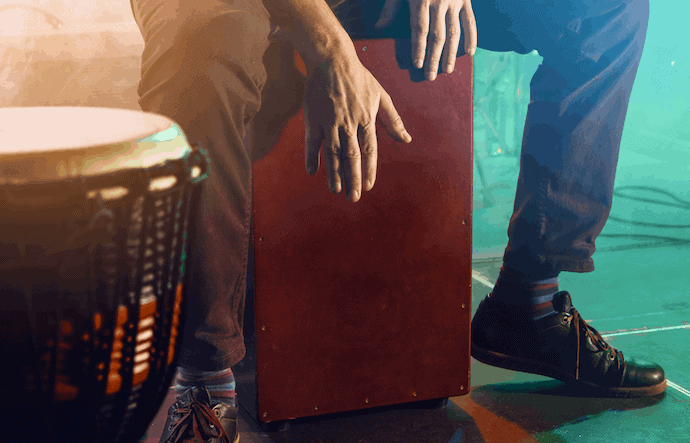 The cajon can be seen in small venues like restaurants and bars that want to put on live bands once in a while but aren’t allowed to use real drums due to noise ordinance and such. If you’re trying to get an authentic Peruvian sound, you should look for a cajon that lets you play with the wires off the tapa or front plate. Of course, a hollow cajon would be even better. If you want more range from your cajon, you might want to look for specific types of wires and a high degree of adjustability. Some cajons have a small lever outside of the box. By playing with it, you can customize your sound based on whether the wires touch the tapa. This feature is very important if you also want to use something like a pedal to give the box a kick drum sound. If you get an adjustable cajon, you can alter the sound. Increasing the wire tension allows you to potentially give it a snare drum sound (if it has snare drum wires). You can also give the drum a more rattling sound if you lower the pressure. Adjusting the slap corners also lets you alter the sound. You should also note that small cajons tend to have a thin-sounding bass. If you’re looking for something that can play loud and with deeper bass then you’ll want a larger box. Not all cajons are designed for the same situation. 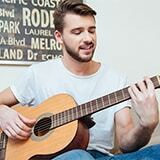 Keep in mind that when accompanying an acoustic guitar player, you’ll want a distinctive and deep bass tone. The same can’t be said if you’re in a jam session with a jazz or funk bass player. There, the extra bass will just muddy up the sound. Whether you’re trying to start a Flamenco band, tired of bongos, or exploring the idea of a cajon, know that the tonal profile of a cajon is not subjective. Some people will need a specific profile while others are satisfied to play on just about anything. So, which is the best cajon for you? Given the adjustability of most cajons, getting the tone just right is very doable. But if you want to really learn the instrument and perhaps even master it, make sure to get one that can take some punishments and support your weight for hours at a time.